I was tempted to skip this week, partly because my blog has been review-light lately and I feel like I’m doing all the memes (I’m reading the entire Noughts and Crosses series and doing an overall review when I’m done) and partly because I haven’t been blogging for very long to experience all these great blogger things, at the minute I’m still kind of just putting my voice out there on the inter-webby-waves and hoping someone enjoys reading them! This post started as a comment over on Book Badger, but I thought I’d share my Top Five Favourite Things About Being a Book Geek here. 1. 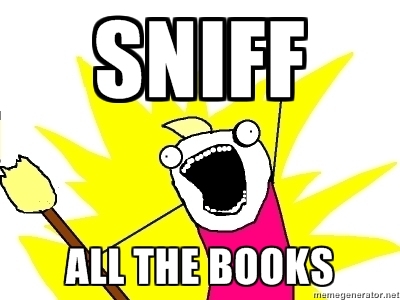 The SMELL – it seems only true book lovers are proper “book sniffers”. We all do it don’t we? You get a new book, you crack it open and sniff. 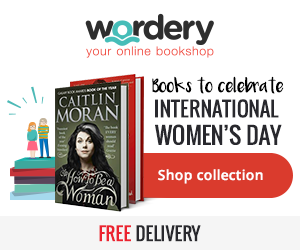 School books, notebooks, novels, non-fiction – we don’t discriminate. 2. The Escapism – I’m big into psychology and wonder if there are any common denominators in people who love to read, what makes one person love reading, and makes another hate it? I don’t dislike people who don’t like to read, but I struggle to understand it. I can pick up a book and spend a few hours with different people, in a different place. What’s not to love? 3. The Maturity/Wisdom Factor(?!) – I don’t know if this is actually a thing, but I feel like reading stories about cancer survivors, a fictional future world, wizards, right and wrong, good and evil, heartbreak, divorce etc. gives me a new perspective on life and shapes me every time I read a new story. I’m exposed to all of these situations in a way that I possibly wouldn’t be in my normal lifetime. I feel for these characters and I think I learn about life through their stories. 4. The Feels! Book boyfriends, book best friends, book love triangles, book goodbyes. It’s kind of nice to know in our digital, fast-paced, “I want it now and I want all the tech” age that we can still get all the feels, there’s hope for the world yet… I have a bookshelf full of people I admire, adore and despise (Voldemort Dolores Umbridge, anyone?) and walking into a beautiful smelling bookstore (there’s the sniffer in me again! ), meeting an author, getting a delivery of books etc. still makes me feel something similar to innocent child-like excitement. Your #1 is the reason I don’t care for eReaders. I’ll do it, but my iPad just doesn’t smell that great. You’ll read on your iPad, or you’ve tried to sniff it?? 🙂 I’m definitely going to do a Rant post about the paper vs pixel debate as it’s so topical. I do think eReaders and tablets have their purpose (and they’re so handy for putting together a review with the highlight and note capabilities) but nothing will ever compare to a paper copy of your favourite book and a beautiful bookcase you can be proud of. Thanks for commenting! Haha, you definitely are a book sniffer! But I love #3 the most — the maturity and wisdom that comes from living a thousand lives, from experiencing a thousand perspectives. I do think bookish people who read fiction widely have a lot of empathy that I just don’t find in “regular” people. It’s part of why I love this community so much! I agree with all 5! New books just smell amazing, how can you not want to sniff them. Old bookshops smell great too. THE FEEEEEEEEELS!!!! Reading would be nothing if not for the feels! Great list, I hope you enjoy reading Noughts & Crosses. It’s one of my favourite series, I met Malorie Blackman for the second time at London Book Fair and finally got the whole series signed. Hi, thanks for commenting! I’m glad you liked my take on the post, I thought it fitted in quite well with the theme of this blog. The memes can be quite time consuming, but I really enjoy them and the discussions they generate, I’m just very conscious that until I complete the Noughts and Crosses series this blog is going to be relatively light on reviews – if only there was more time to read without life getting in the way! !